b. 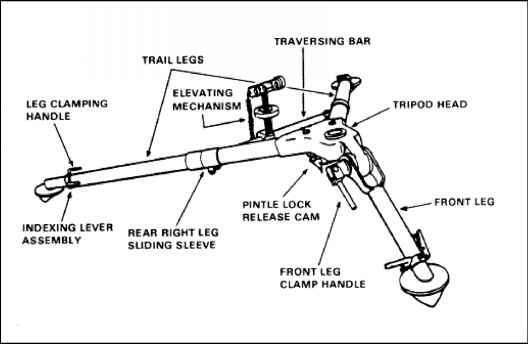 Mounting and Dismounting Procedures. The AN/PEQ-2A can be mounted on various weapons or used in the hand-held mode to illuminate and designate targets. (1) Mounting Procedures. Ensure that the mounting bracket is installed before proceeding. (a) Secure the bracket adapter to the underside of the AN/PEQ-2A. (b) Place the bracket adapter into the MK 19 bracket mounting groove, located in the center of the rail grabber. (c) Tighten the bracket's lever screw into the bracket adapter hole. (d) Plug the cable into the AN/PEQ-2A and run the cable to the front of the MK 19 bracket. The "cable switch, 12-inch, membrane" or the "cable switch, 20-inch, button" may be used for remote access. (e) Once the cable is secure at the front of the MK 19 bracket (ensure the cable will not become damaged by the movement of the quadrant portion of the bracket) run it between the MK 19 and the bracket to the handles on the backplate assembly. If using the button cable, attach Velcro to the top of the night handle and secure excess cable to the handle. If using the membrane pad, run it the same way as with the button cable and attach the membrane to the inside of the right handle. (2) Dismounting Procedures. Dismount the AN/PEQ-2A when the mission is complete, when it is needed on another weapon, or when it will be used in its hand-held mode. (a) Untie the cable and disconnect the remote button from the backplate handles. (b) Unplug the cable from the AN/PEQ-2A and place the cable back in the carrying case. (c) Turn the AN/PEQ-2A mounting screw counterclockwise and remove the AN/PEQ-2A from the bracket adapter. (d) Unscrew the bracket adapter from the MK 19 bracket rail and place the bracket adapter and the AN/PEQ-2A in its carrying case. c. Boresighting Procedures. Boresighting aligns the sighting system to the bore of the weapon. The AN/PEM-1 Borelight is used for this procedure. (1) Place the MK 19 in the ready to fire position 10 meters from the bore light offset zero target. Use the 10 meter distance gauge in the borelight kit to measure the distance. Ensure the target and weapon are level and stable (the bore sight zero will be off if not) before making any adjustments to the laser. (2) Set the range on the MK 19 bracket to 500 meters. (3) Mount the bore light and turn it on. While holding the MK 19 steady, zero the bore light. Follow the instructions in the AN/PEM-1 borelight operations manual for further details. The 40-mm MK 19 mandrel interface (NSN 3460-01-502-0575) is used with the 5.56-mm mandrel interface and has to be ordered separately. (4) Make adjustments with the T&E mechanism until the bore light is on the bore light aiming point. (5) Adjust the windage and elevation of the aiming laser until the laser is on the laser aiming point. (6) Re-check the bore light aiming point and then the laser aiming point again. (7) To zero the IR light source narrow the beam as much as possible and adjust its windage and elevation until the beam is 4 centimeters horizontally to the left of the laser aiming point while the aiming laser is still on the laser aiming point. The AN/PEQ-2A is now boresighted. d. Zeroing Procedures. Zeroing the weapon aligns the line of sight of the AN/PEQ-2A with the trajectory of the round so that they intersect at 500 meters. (1) Set the MK 19 mounting bracket to 500 meters by loosening the friction knob on the left side of the mount. Press and hold the friction knob in (towards the mount), then slide the mount assembly to the 500-meter increment. Release and tighten the friction knob. (2) Identify a 500-meter target downrange and fire one round; note the impact of the round in relation to the target. (3) Adjust the aiming light on the AN/PEQ-2A to the impact of the round by adjusting the elevation and windage adjusters. (4) Manipulate the T&E mechanism so that the aiming light is center mass on the target. Repeat until the point of impact is the same as the point of aim. (5) Adjust the illuminating beam's elevation and windage adjusters so that the aiming light is in the center of the illuminating beam.